Wilson Collection. Image courtesy I. Wilson. Copies: DC (bound with Correspondence between the local Government of Van Diemen’s Land and the Proprietors of the Colonial Times and other material); KCL (inserted in Letter addressed to Joseph Hume); ML (2 copies, one bound with another copy of the Correspondence pamphlet, the other in AP, v. 41, A2201); TNA (CO280/88 f. 473. Enclosure in Hume to Grey 25 May 1837. 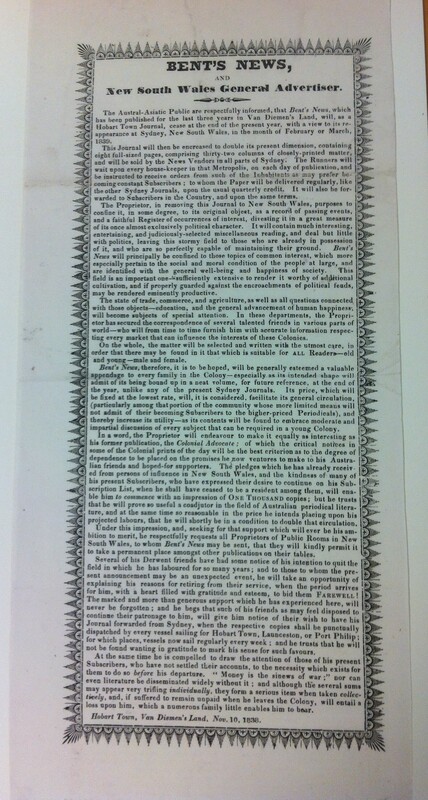 In this copy the words ‘or in colonial lands’ in last paragraph are blacked out in ink); Wilson collection. Bent’s petition sought compensation for the losses he had suffered as a result of Arthur’s ‘illegal and oppressive’ conduct towards him. Presented by Joseph Hume 1 June 1837. In the meantime Arthur had submitted a long commentary justifying his actions to Secretary of State Glenelg, deemed satisfactory and tabled in the House on 14 July. Sir John Franklin was asked to communicate the unfavourable outcome to Bent. The day before Arthur left VDL Bent sent him a copy of the petition. 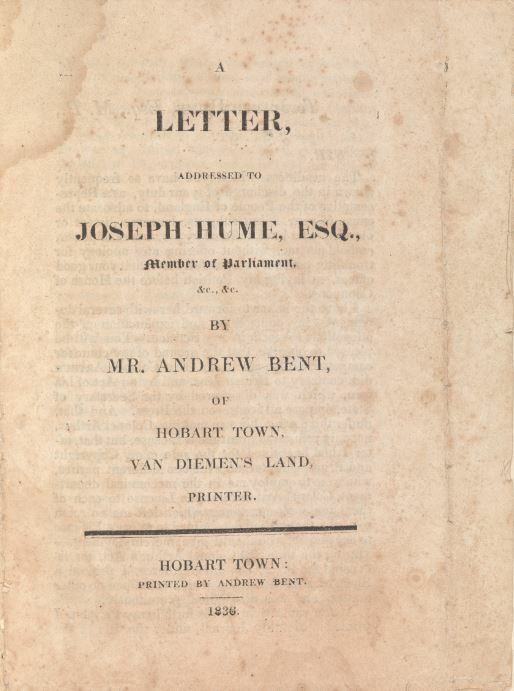 The accompanying letter, signed ‘Your Excellency’s Victim’, was printed in Bent’s News on 5 Nov.
A Letter addressed to Joseph Hume, Esq., Member of Parliament, &c., &c. by Mr. Andrew Bent, of Hobart Town, Van Diemen’s Land, Printer. Hobart Town: Printed by Andrew Bent. 1836. 8 p., 20.3 x 13.5 cm. Ferguson 2092. Copies: Crowther; DC; KCL (with copy of Bent’s petition bound in at end). ML (2 copies. Copy at 323.445/2A1 inscribed ‘For M: Forster Equ.’ Copy at DSM 323.1 inscribed ‘Recd July 14 1837’ and bound as first item in a compilation which includes the petition, and all the other items listed in the letter to Hume as being sent with it; Ferguson lists a copy in ANL but it is not in the catalogue and cannot be located as at 4 Aug 2018. Provides further explanation and details of the charges made in Bent’s petition. 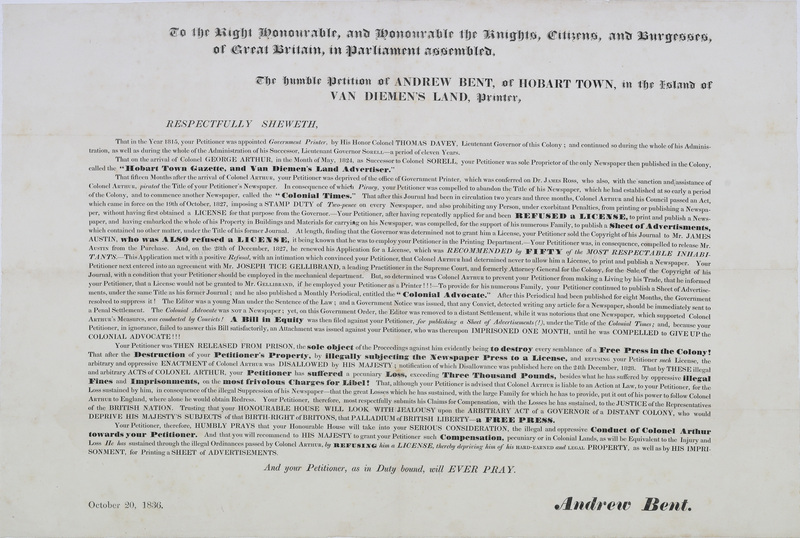 Includes a list of other documents Bent sent to Hume at that time: The address praying for repeal of the Newspaper License Act (1827) — The correspondence about the licence for the Colonial Times (1827) — Copies of Bent’s News for 3 and 17 Sep., 22 and 29 Oct. and 19 Nov. 1836 — Letter from Thomas Anstey giving his opinion of Mr. Bent’s journal. Publication announced in Bent’s News 25 June 1836. The lyrics were printed in Bent’s News, but no separate copies of the songs survive. Kermode, William. Mr Kermode’s Statement of Facts, relating to the recent Altercation between Messrs. Gregson, Jellicoe, and Arthur. 1836. No printer named but William Kermode had a long association with Bent and the use of old English font on t.p. is stylistically typical of Bent’s printing. In the poisonous atmosphere surrounding Arthur’s departure from VDL a dispute developed between T. G. Gregson and Arthur supporter Henry Jellicoe. Kermode acted as Gregson’s ‘friend’ while Jellicoe received support from Henry Arthur (nephew of the late Governor). Insulting placards were posted around the town and Gregson fought a pistol duel with Jellicoe in which the latter was wounded. He also took a horsewhip to Henry Arthur. Gregson was gaoled and fined for the assault but received much public support via a petition. He was released by newly arrived Governor Franklin as a gesture of good will. 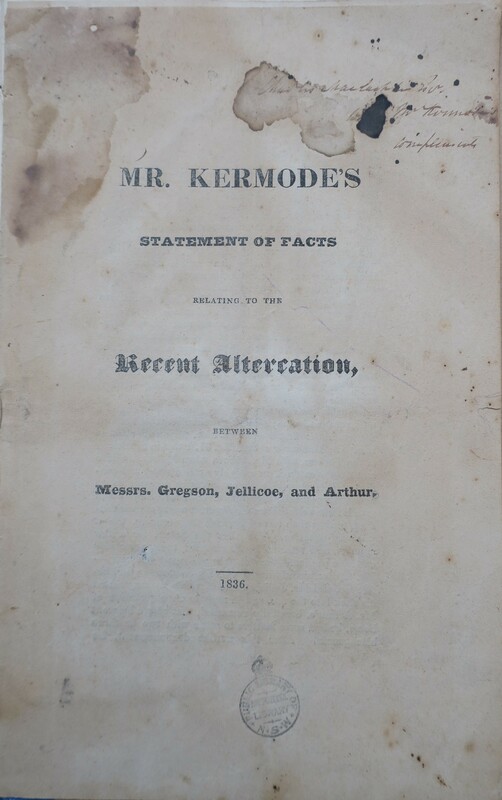 The text of Kermode’s statement was published in the Cornwall Chronicle on 17 Dec. 1836. Also printed in Bent’s News 7 Dec. 1838 and following issues and in the first issue of the paper in Sydney.